If you’re looking to renovate or refresh your kitchen this year, look no further than these 8 trends guaranteed to freshen up the heart of your home. Colour is starting to creep back into kitchens and two-tone units are the perfect way to add interest. Keep it subtle with greys and blues or pick a bright contrasting colour to really stand out. Pantone recently announced their colour of the year as Ultra Violet. This strong colour is already dividing opinion but it’s going to be everywhere this year! If purple kitchen furniture is a bit much for you, try accessorising with violet accents instead. Induction cooking is set to really take off this year due to its ease, speed, safety and style. 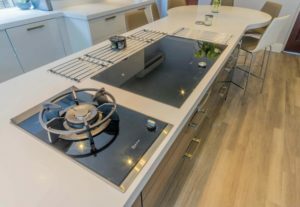 Induction hobs lay flat against work surfaces creating a sleek and streamlined effect and once the pans are removed, no more heat is generated, making the hobs safer than their ceramic counterparts. The hobs reduce cooking time and save energy and money over time. What’s not to love? Chrome has had its moment; this year it’s all about opulent gold and copper accents. Use them to add a touch of luxury to your kitchen. Cast out the winter blues with a nod to warmer climes. The beauty of the Moroccan trend is its versatility; it can be incorporated as much or as little as you like and still look great. Splashbacks and tiles are a perfect way to infuse the essence of Morocco into your kitchen. See our previous blog post for ways to introduce this exotic décor into your whole home. Dramatic marble worktops look like they’re here to stay for 2018 and beyond. Pair with neutral cabinets to really make a statement. Reflect your personality and express your individuality with bursts of colour or all-out vibrant clashing hues.